Blink once and these fast little pups are gone. Learn more about the spunky English racing dog. Whippets are the fastest domesticated animals of their weight. They can get up to breakneck speeds of 35 mph, thanks in part to their unique running style. Similar to the greyhound, the dogs use a double suspension gallop. If you watch them run, at one point, all their feet are on the ground, and the next, all four paws are in the air, parallel to the ground. 2. THAT MIGHT BE WHERE THE NAME COMES FROM. “Whip it,” is an old English phrase, meaning to go swiftly, specifically referring to riders whipping their horses to move more quickly. Another theory is the name is a misspelling of "wappet," a small yipping dog. 3. THE BREED DATES BACK TO THE 1600s. Whippets and other sighthounds have been present in art and literature going back to the 1600s (the first mention of a whippet was in 1610), but the idea of an official pure breed didn’t come about until the 1800s. There was a lot of interbreeding between types of dogs before official clubs were set up, but it is believed that the whippet is the descendant of the greyhound and the terrier. 4. THEY WERE CONSIDERED THE POOR MAN’S GREYHOUND. Greyhounds were seen as refined and elegant dogs, so only the rich had access to them. The poorer class settled for the modest whippet instead. Unlike the greyhound used in coursing, whippets were more commonly employed to hunt and catch rabbits for their owners to eat. The dogs were also often used for gambling. Sometimes called “snap dogs,” whippets would enter arenas with rabbits and “snap” them up. There was no chance for the rabbit to escape, so the sport was considered uncouth by the upper class. Later, owners realized the dogs would chase waving rags, birthing a form of dog racing. 5. ENGLISH MILLERS BROUGHT THEM TO AMERICA. Workers in textile mills in Massachusetts in the 1900s would enjoy coursing and other sports with their whippets on Sundays. For a time, the state was the hot spot for dog racing. 5. TO A WHIPPET, THE COUCH IS JUST AS GOOD AS THE RACE TRACK. Whippets love to run and are incredible sprinters, but after brief periods of activity, they're ready to kick back. If you get a whippet, be prepared to share some space on the couch. 6. THEY NEED TO BE BUNDLED UP IN COLD WEATHER. 7. SOME ARE PRETTY BUFF. One gene mutation, which only occurs in whippets, can make them very muscular. 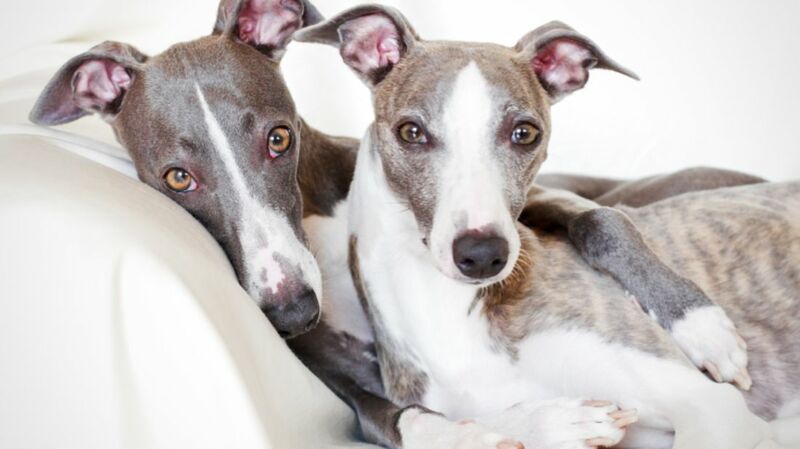 These unusually-fit dogs are called bully whippets. Sadly, breeders will often put these dogs down for not meeting the proper standards. The myostatin gene is the component responsible for the dogs' strong builds. Two myostatin genes create a normal whippet, while two mutant myostatin genes creates a bully whippet. The reason this mutation has not been totally bred out of the breed is because having one of each makes for an extremely fast racing whippet. One bully whippet named Wendy made headlines in 2007 for her extremely brawny physique. Dubbed the “strongest dog in the world” (this, of course, is up for debate), Wendy captivated the public. Rumors that Wendy was on steroids, or was a genetically modified soldier dog, circulated on the Internet. In reality, Wendy was a normal whippet with just a slightly different genetic makeup. 9. DON'T COUNT ON THEM TO BARK. For the most part, whippets are incredibly quiet, friendly dogs. Which means, you shouldn't count on them to guard you or your home: Most love strangers, and some whippets don't ever bark. 10. THEY'RE TOO CUTE FOR HORROR MOVIES. As part of the plot for the movie Alien 3,an alien chest-burster comes out of an ox. These creatures were meant to resemble whatever animal they emerged from, so filmmakers needed to create an alien that would scurry around on all fours. Given that they're both small and fast, whippets seemed like the natural solution. But after fitting one into the alien suit, two problems emerged: One, you can't cover a dog's face without making it panic, and two, whippets have a uniquely adorable walk. Watching a whippet run down a corridor in costume was not quite as horrifying as the director hoped, so the idea was scrapped.